Kazuo Ishiguro once again explores his favorite theme – memory – in When We Were Orphans, a novel set in and around the time of the Second World War. Distinguished British detective Christopher Banks has established a reputation in London for having successfully solved all the cases that fell onto his lap – all but for one, and the most important one at that: the mysterious disappearance of his parents when he was a little boy living in the International Settlement in Shanghai, China. Thus, he returns to Shanghai to resolve the matter and finds himself tangled in memories of the years past, exploring each memory with both careful intimacy and urgency as well. The narrative goes back and forth between the past and the present: Christopher’s recollections of his childhood make up the narrative from the past. The narrative also see-saws between London, where Christopher resides with his adopted ward, Jenny, and Shanghai, where much of his childhood years were spent with his parents and his Japanese friend, Akira. At the heart of the novel is a mystery that can only be unraveled by combining Christopher’s memories of those childhood years in Shanghai and his talents as a renowned detective in London. The thing with writing about memory is that it almost always touches upon its infallibility: how much can we recall from the past, and how accurate are these recollections? In When We Were Orphans, Christopher conjures up memories of his childhood years in Shanghai in an attempt to reconstruct the days leading up to the disappearance of his parents – his father first, and then his mother not long after – and even though he is certain of their exactitude at first, later on he entertains doubts especially with regard to small details. He thinks about his old friend, Akira, who lives with his parents in the Settlement, and how they used to play detective in their spare time. He remembers his parents, especially his mother, whose presence was more evident than his father’s. He also recalls his Uncle Philip, a family friend who was curiously present during the more significant days of Christopher’s life. In these recollections, Christopher’s memory is put to the test. One of the things about Christopher’s childhood that stayed with me – and which would eventually resurface in his adulthood, upon his return to Shanghai – was his friendship with Akira. It was a fragile friendship, which can be expected at their young age, but it endured. Several times, they found themselves in a situation where one thoughtless word could cost them that friendship, but they both exercised caution and self-control. Christopher as an adult, however, puzzled me. As a detective, one would presume that he had a nose for smelling inconsistencies and improbabilities, that he had a sharp, intuitive character that made him good at his job. Unfortunately, Christopher did not display any of those when he was finally faced with the task of solving the mysterious disappearance of his parents; instead, he was blind to the obvious possibilities and even ignored danger just to be able to solve the case. Did he purposely shun his detective instincts and allowed the emotions of an orphaned son overcome his better judgment? Was his longing for his parents – who he fervently hoped were still alive even after all those decades – so terrible and great that he willingly closed his eyes to the possibility that they were already dead? In this regard, one cannot help but sympathize with Christopher. Imagine having lost your parents when you were but nine years old and then being completely in the dark as to the fate that befell them – he did not even know if they had died, or if they were just being held captive, but kept alive by their captors. He had no clue. So when he was finally armed with the means and the capacity to try and discover what happened to them, one cannot help but cheer him on. But not to the point of disregarding the danger to his own life, and not despite the evident possibility that his search has become an exercise in futility. It all felt surreal to me, the part where Christopher was forcing his own reality into what clearly was not. It felt odd that he would suddenly find himself in a dangerous situation – a situation brought about by the impending war – and it felt even stranger that despite the obvious threats to his life, he would still pursue a lead that would supposedly yield his parents. Has he lost his mind completely? Was it so muddled by his desire to be reunited with his parents despite all the signs that they were most likely no longer around? Was he terribly deluded? Knowing what was real, though, I welcomed the strangeness of the situation and chalked it up to Christopher losing all control of his senses out of desperation. Eventually, Christopher would be faced with the truth, and he comes to terms with what has come to pass, as he should. As always, Ishiguro’s solemn and quiet writing drew me in. It will always be one of the things that will keep me reading Ishiguro: the silence of his words. And even if he will keep re-exploring and rewriting his favorite theme, I’d still read each and every one. "... they were just things. When you've lost your mother and your father, you can't care so much about things, can you?" I wish I had lots of time to get read Ishi's backlist. Might start from his first novel and work my way up (meaning this novel is my 4th TBR Ishi edition). I agree. Christopher is not only an inconsistent narrator, he is also an inconsistent detective. But I liked that about him, in a sense. It made him more real, more human, I suppose. I didn't expect that reading this book would be a breeze. 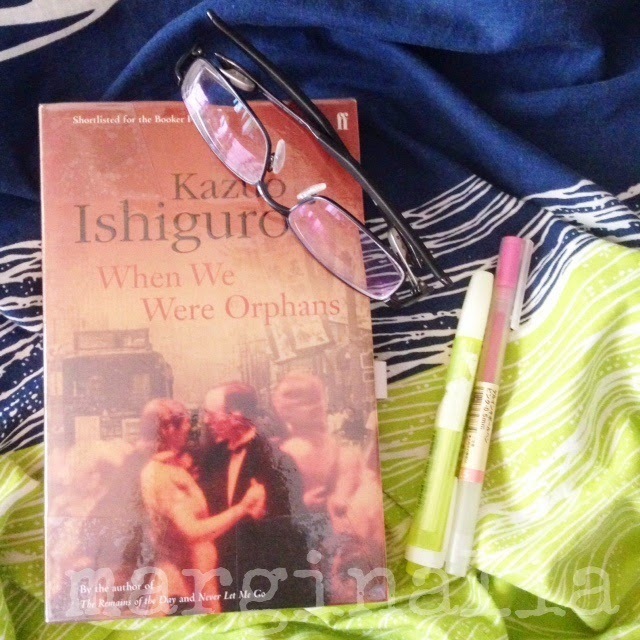 I'm glad Ishiguro did not give me a hard time, haha! Indeed, solemn and silent are the words that best describe his prose.